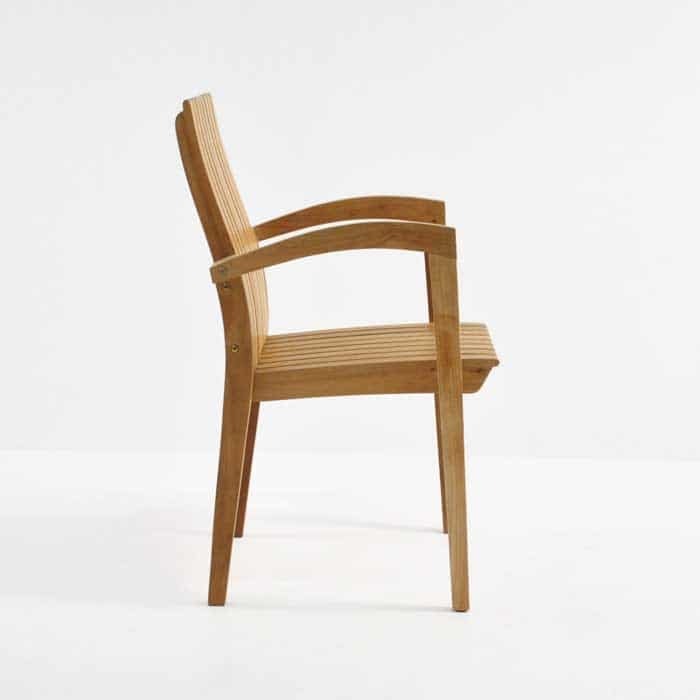 Elegant, poised and unique; the Raffles Teak Stacking Chair is one of our most popular teak dining chairs. 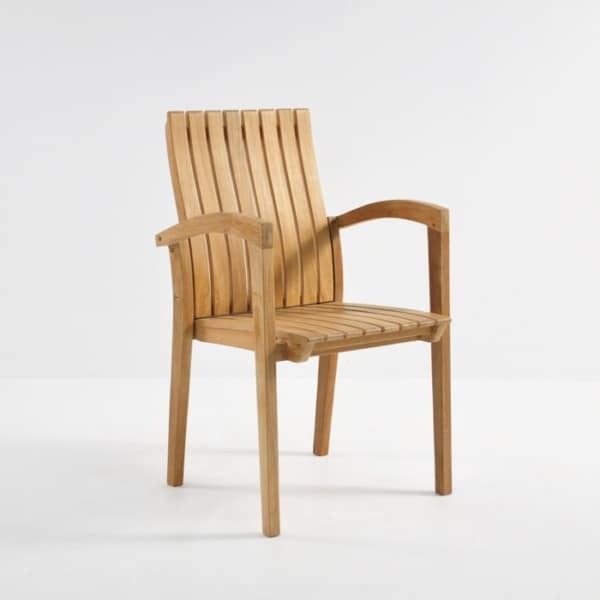 Inspired by mid-century, modern architecture; the Raffles Teak Stacking Chair is a best seller at Teak Warehouse. A fabulous, intricate design with panels of sturdy A-Grade Teak curved in such a way that supports the lower back and makes for an attractive and comfortable chair that highlights the beauty of the wood. At convenient dining height, this teak stacking chair is perfect for grand outdoor dining experiences. 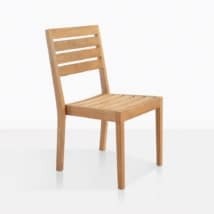 The Raffles Teak Stacking Chair is compatible with a variety of our A-Grade teak dining tables! Pair up 8 Raffles Chairs with a Hampton 78” Table for a regal look that encourages you to trust in the solid timbers, and to kick back and unwind in comfort and style. W22" x D24" x H36"
These teak dining chairs also look great in a café setting; ideal for a smaller patio. Place a 35” Round Pedestal Table in the centre of your space, with four Raffles Stacking Chairs around the table, creating a superb spot for lunch or a casual dinner. Place an umbrella overhead, such as our versatile Antigua Umbrella, and get ready to relax in style and comfort. 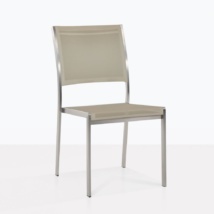 The Raffles Stacking Chair stacks 4 high, and are sold separately. They are an ideal choice for big or small parties! Just stack them away when you’re done! 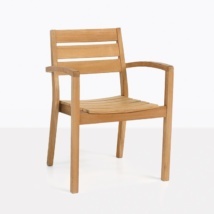 The Raffles Teak Stacking Chair is made out of A-Grade Teak, the foremost preferred wood for outdoor furniture. With natural oil and rubber content; A-Grade Teak is stronger, durable and longer lasting than any other wood product, which is why we only use the best! 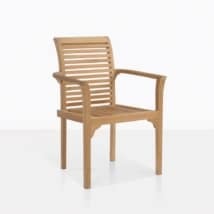 Teak is the best natural material for outdoor furniture. A Grade Teak is what Teak Warehouse is famous for. This isn’t standard Teak wood. A-Grade teak is milled from the premium part of the tree. All A-Grade teak in all aspects is the best looking most consistent teak available. We use only A-Grade teak for our new teak products (we also sell premium reclaimed teak furniture). Our A-Grade teak has the following benefits of teak such as: it is hard and dense; evenly grained, gorgeous and all-weather capable. A-Grade teak develops a smooth even patina over time in outdoor conditions and has inherent qualities in the wood to resist pests and bugs and rot. Our teak is sustainably harvested in the Perum Perhutani organization in Central Java, Indonesia. We are proud that we use mature trees which are 40 years old or more, for our outdoor furniture. A-Grade Teak is the best natural material for outdoor furniture. 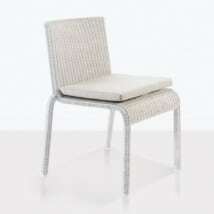 It simply has no equal for this application especially for the marine industry and outdoor furniture. It’s been used out at sea for centuries in boats and sea-going vessels subject to saltwater and UV exposure. To maintain your teak, there are specific and beneficial practices and techniques. For this information we invite you to click through to see comprehensive A-Grade Teak Furniture Care information. © 2019 Copyright Teak Warehouse. All Rights Reserved. and data compilations is the property of Teak Warehouse and is protected by international copyright laws. We personally answer the phones at our Redondo Beach warehouse 7 days a week from 10am to 6pm. If you call outside of normal business hours, leave a message and we'll get right back to you. We are not a call center; we personally answer our customer calls.